A blend of Colombian rums aged 12 to 21 years old, La Hechicera translates as "the witch". 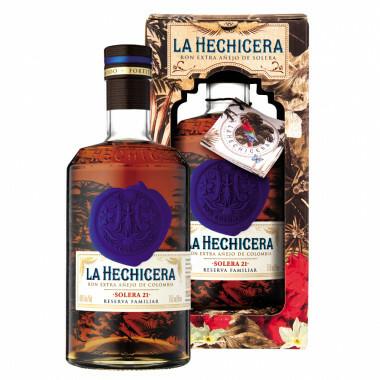 La Hechicera rum (the enchantress) is a blend of rums aged between 12 and 21 years old, aged in charred American oak casks, according to the solera system. La Hechicera, translating as "the witch" has no additive or added sugar, and is a vibrant homage to Colombia, a land of amazing beauty and wild nature. Nose: perfumes of caramel and orange zest. Palate: intense aromas of tobacco and roasted coffee.